Personalized Interior Design Services - S & B Interiors, Inc.
Not every client has the same needs. The traditional interior design client, looks for a designer who can design their home or office, select all finish material options and bring them to their home or office, and then the designer oversees the fabrication and installation of everything. As the internet and amount of catalogs available to everyone has proliferated, there are clients who want a designer to provide layouts and color palettes, but then the client will take the time to shop on their own. They may call back the designer to review their selections and assist in the decision making process. As needed, they will ask the designer to do the follow up and assist in the installations to be sure they are completed in a professional manner. In yet other instances, a client may not want assistance in changing their home or office with the furniture they have. They want to update what they have, but do not want to toss everything they have out and start again. We can work with the client to refinish, reupholster, paint, and modify almost anything in their home. 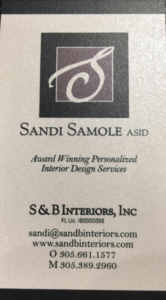 For close to 40 years, Sandi Samole and S & B Interiors, Inc. has provided award winning interior design services. We are now emphasizing the “Personalized” nature of our Interior Design Services. 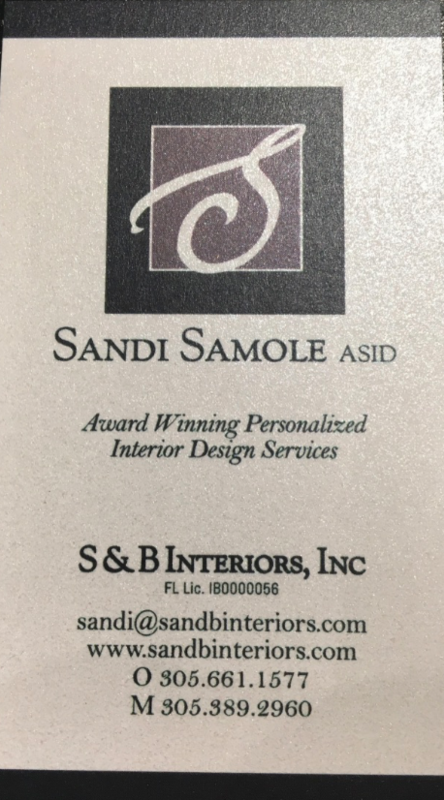 Our new Business Card, designed by Leah Becker, a new graphic artist on the scene in Miami reflects the hands on attention Sandi gives to each client. A PERSONALIZED design approach and plan is developed to meet the needs of a particular project.